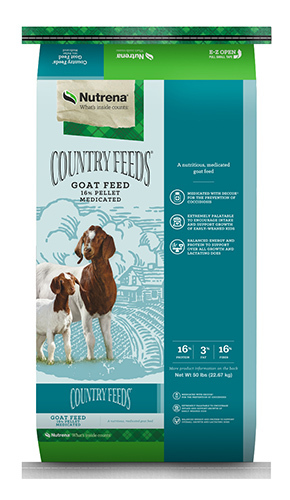 This medicated feed is designed to be fed to goats. Medicated for the prevention of coccidiosis in young goats caused by Eimeria christenseni and Eimeria ninakohlyakimovae. Feed as directed. Each LB of Country Feeds Goat 16% Pellets Medicated contains 13.6 mg Decoquinate. Feed at the rate of 1.67 Lb per 100 LB bodyweight to provide 22.7 mg Decoquniate per 100 LB bodyweight per day. Provide good-quality hay at the rate 1 LB per 100 LB bodyweight or access to pasture. Feed at least 28 days during periods of exposure or when experience indicates that coccidiosis is likely to be a hazard.